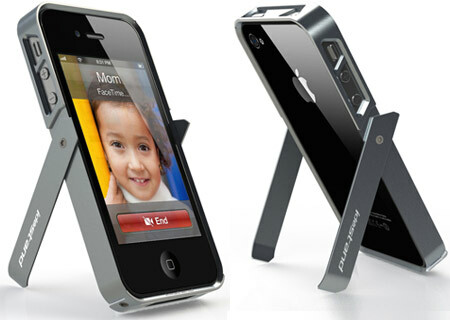 If an iDevice had arms, an iPhone and IdoStand case combination is probably very close to what it would look like. Designer Allen Ospina has basically envisioned an Apple smartphone that can hold itself up on prosthetic limbs, with his forthcoming sheath for it. So for all those times that users need to keep the handset out of their hands and prop it up in a particular position, this new case provides yet another option. Apart from offering the ability to hold the device in landscape as well as portrait modes, the accessory also seems to deliver a layer of protection from certain types of damage. The case appears to be built out of some kind of metal and it hugs onto the sides of the iPhone. As far as we can tell, only the edges of the handset will be guarded, with the back exposed to the elements. 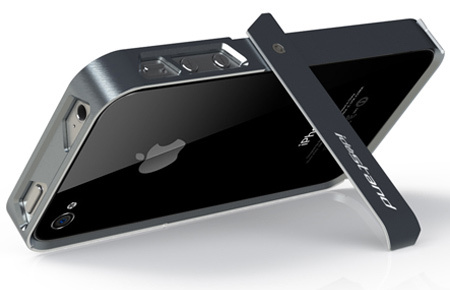 What potential users may be looking at is a sheath enveloping just the frame of the smartphone. The layer surrounding the device shows off cutouts for the volume rockers, connector and other controls that make their home on the edges. Whether it’s watching content or FaceTime calls, users should be able to slant the phone at varying degrees in portrait mode at least. Scheduled to be put up for Kickstarter backing from tomorrow onwards, the IdoStand iPhone case was picked up by Yanko Design who calls it ‘pure genius.’ So once the said page is up and running, interested parties will be able to order one for themselves.